I don`t drink white wines in winter that often. A season for them starts normally at the end of march. But there`s no need to be a prisoner of habits. A creamy seefood pasta was screaming for a Riesling! Bought this Bio Riesling from a little wine shop in Berlin, Prenzlauerberg for 13 e. So not a big investment. Shy bouqet of citrus notes, yeast, flintyness. On the palate light bodied, lively, very citrusy with a high and piercing acidity. Medium and a bit tart aftertaste of honeyed grapefruit and lemon peel rounded up with pungent chalkyness and a hint of smoke. 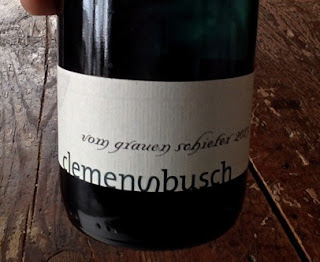 A solid, midweight, entry level Mosel Riesling. Nothing to write home about, but for the price this delivers.